Governments, businesses, organizations and citizens want to know where their food comes from. Many assume it originates at a farm, but that’s often all they know. Once products leave a farm, it is difficult to know the exact journey it takes before it ends up on the plate. To ensure products are free of food-borne illness, or for economic development purposes, it’s important to trace food. 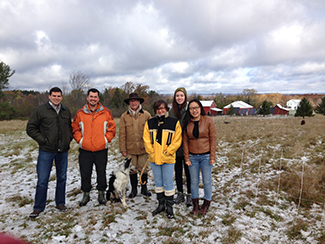 With funding from the National Science Foundation Early-Concept Grant for Exploratory Research, our team is exploring the unique characteristics of small farmers as food producers. Focusing on “farm to institution” in the NY Capital Region, we are working with Professor of Biology Gary Kleppel of the Kleppel Lab for Agricultural Ecology and Sustainable Food Production at the University at Albany on analyzing the dynamics among small local farms, food distributors, institutional buyers, and key government and NGOs. We are also identifying enablers and barriers for small farmers to participate in a whole-chain food traceability system. The project will conclude with a preliminary data and technology architecture including data specifications, policies, and governance that promote food supply chain integrity, including food source traceability, potentially applicable to small farms with fewer resources than larger counterparts. This will provide new perspectives on data standardization as a different approach to traceability between small farms to institutions. The case analysis will also help present improved methods for applying traceability and product integrity to small farms.